Unlike typical dog agility, Treibball doesn’t require that you the handler run along tirelessly. 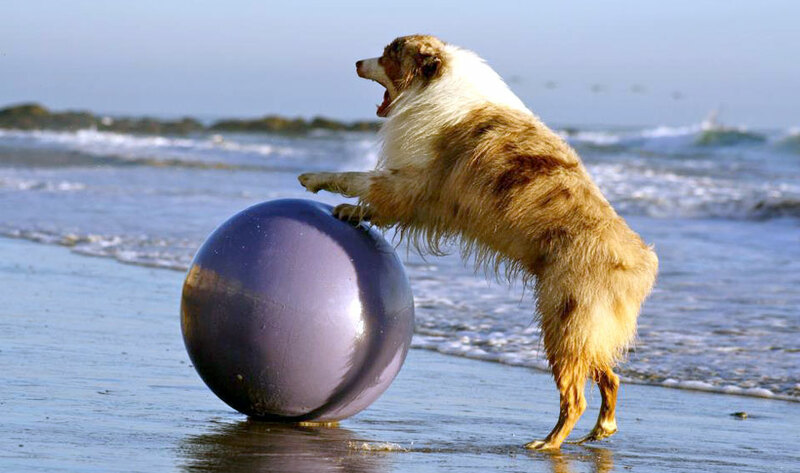 By using your voice and other commands, you and your dog work as a team to drive the balls into a goal within a set period of time. Swiss Balls are a fabulous play-tool to help build your horse’s confidence while encouraging curiosity and focus. The Swiss ball will allow you to simulate things your horse may be afraid of and will help build confidence around objects in motion and sudden movements. In order to train a horse using an exercise ball, you’ll need to be patient – give the horse space to discover the accessory in its own good time. In some cases, the horse may reject the exercise ball outright – don’t panic if this occurs as it is a perfectly legitimate response. Exposure over time is the most decisive factor in building confidence. If you regularly train a horse using an exercise ball, you’ll curb any nervous, spooky behaviour that may make riding a danger as the horse gets used to foreign objects coming into contact with its personal space. Using this cheerful accessory to train a horse will instil good behaviour.